Watch the colours of Spring emerge bringing new beginnings & inspiration. Visit our famous National Park while nature blooms and then wander the breath-taking landscape of Killarney as the sun shines hot & the wind blows cold: when it is summer in the light and winter in the shade. Stay at Randles for one night and and we'll upgrade you to one of our Signature Rooms while you unwind by crackling log fires in The Drawing Room, or relax in Wiggs' Bar for a glass or two. Relax in the morning with a late check out of 2pm and lose yourself in the intimate Zen Spa or awaken your senses with a revitalising dip in the twenty metre pool. All within a short stroll from the bustle of downtown Killarney. Book Direct For Best Rate. Contact Randles Hotel on +353 (0) 64 6635333 or email reservations department at info@randleshotel.com. Book Direct For Best Rate. Spring is a very special time in Killarney. Nature is at it’s best as the colours of Spring emerge bringing new beginnings & inspiration. The sun shines hot & the wind blows cold: when it is summer in the light and winter in the shade. Included in your package is a three course dinner at the newly renovated Kayne's Bar & Brasserie located adjacent to Randles Hotel. Kayne's Bar & Brasserie focuses on being Killarney's Best Bar & casual dining experience with a brand new look, vibe and exciting new menu. If you're visiting Killarney this Autumn on a Saturday Night you could be "Lazing on a Sunday Afternoon" with our Bed & Brunch offer. 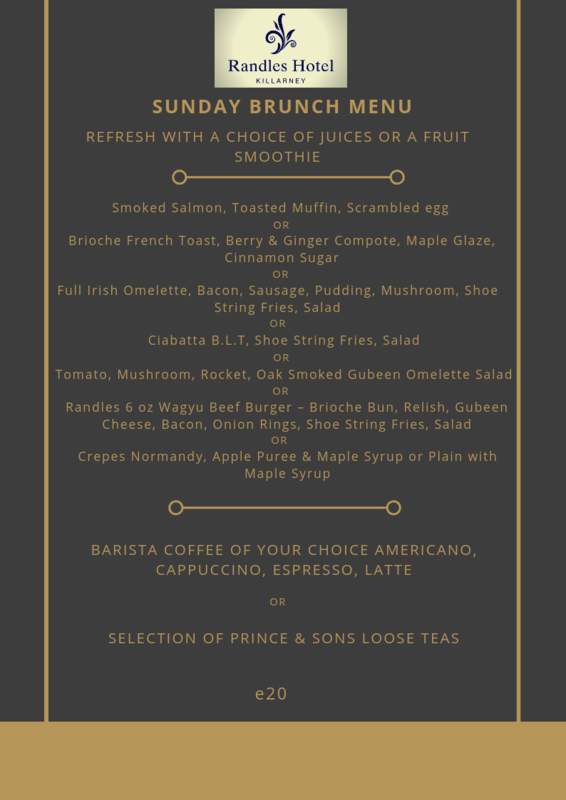 Relax on Sunday Morning and enjoy our All New Complimentary Brunch Menu available from 11-2pm. We will also give you a Late Check-Out of 2pm so you can stay even longer and try out our Club Santé Leisure Centre before heading home. Spring at Randles...The Drawing Room overlooks the MacGillycuddy's Reeks Mountain Range and is flooded with natural daylight, while radiating a warm and unique style. It is the ideal setting for an afternoon of tea by warm crackling fires and classic furnishings, creating an ambience that is perfect for relaxation. 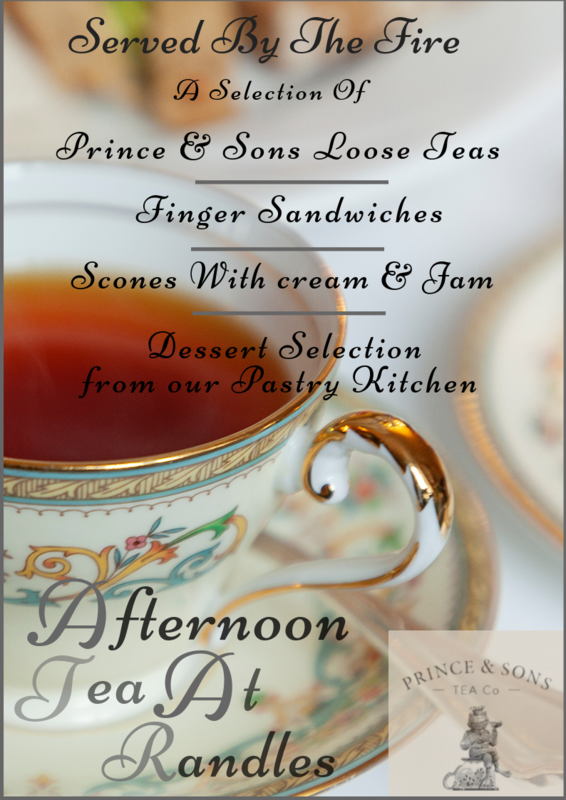 Indulge in our fabulous Afternoon Tea Menu offering elegantly presented treats and a selection of teas while you relax, catch up and experience pure enjoyment. Take some timeout this Spring and visit Randles Hotel for an Exclusive 2 Night Spa Break. Indulge in a 55 minute brochure treatment per person in our Rejuvinaitng Zen Spa and afterwards awaken your senses in our revitalising Club Santé Leisure Centre. On both mornings enjoy complimentary cooked to order berakfast of your choice. Advance booking for your treatment at Zen Day Spa is essential. Please call (064) 662 0972 to arrange your treatment time with one of our therapists. Take some timeout this Spring and visit Randles Hotel for an Exclusive 3 Night Spa Break. Indulge in two 50 minute treatments per person in our Rejuvinaitng Zen Spa and afterwards awaken your senses in our revitalising Club Santé Leisure Centre. On both mornings enjoy complimentary cooked to order berakfast of your choice. Stay at Randles for two nights and and we'll upgrade you to one of our Junior Suites while you enjoy the lit fires and golden evening sunsets here in Killarney. You can enjoy Prosecco and Chocolates in your room on arrival before visiting The Drawing Room - perfect to cozy up with a novel. Relax in Wiggs' Bar for a glass or two and in the morning you could lose yourself in the intimate Zen Spa or awaken your senses with a revitalising dip in the twenty metre pool. All within a short stroll from the bustle of downtown Killarney. Explore Killarney and it's breathtaking scenery while availaing of a 5% Discounted Midweek Rate this Autumn. Unwind by crackling log fires in The Drawing Room, or relax in Wiggs' Bar for a glass or two. In the morning you could lose yourself in the intimate Zen Spa or you might awaken your senses with a revitalising dip in the twenty metre pool. All within a short stroll from the bustle of downtown Killarney. Cancellation -- All regular bookings must be cancelled 48 hours prior to arrival to avoid cancellation charge of first night stay. The booking deposit which is taken at the time of booking is non-refundable. Cancellations can only be implemented by phoning or emailing Randles Hotel directly on info@randleshotel.com. You should save the cancellation confirmation number you receive. Randles Hotels reserves the right to cancel contracts based upon incorrect information having been displayed in relation to price or service. Obvious errors and mistakes (including misprints) are not binding. Disclaimer -- While every effort has been made to ensure the accuracy of all material in the Randles Hotel website, Randles Hotel does not accept direct, indirect or consequential liability for loss or damage due to any errors or omissions. Cancellation -- All regular bookings must be cancelled by 6pm 48 hours prior to arrival to avoid cancellation charge of first night stay. The booking deposit which is taken at the time of booking is non-refundable. Cancellations can only be implemented by phoning or emailing Randles Hotel directly on info@randleshotel.com. You should save the cancellation confirmation number you receive.